Well we start with the wood of the rifles using a Vallejo Leather Brown 147. Okay, strictly speaking this is not a highlight but the rifles are metal and wood so this finishes them off. I tackle them now as the brush work has to be quite tight and any accidents can be glossed over in the next stages. Some washes next, firstly Vallejo Fleshtone Shade 204. This is essentially a quick way of getting a result and in 15mm it works well. It tones down the skin and shades in all the right places. 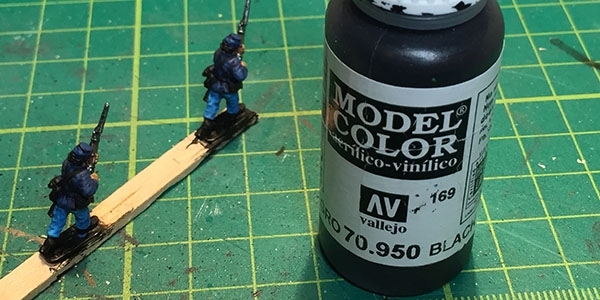 The next wash is for the trousers, Vallejo Blue Shade 207 but mix with water in a 2:1 ratio. To me this give a perfect result, and by that I mean a good look for minimal effort. It’s important to think it down a little but not too much. The final stage of Day 3 is to highlight the jacket with some Vallejo Prussian Blue 051. I just applied lines along the folds of the jacket and wasn’t too fussy about the result, in fact I also tidied up any stray paint from the other stages on the jacket. So we begin Day 4 with Vallejo Black 169. Although the undercoat is black you will find that a) during the painting you will have some painting overlap to tidy and b) the handling of the model, even on my handy sticks, leads to a bit of wear that affects the black most. It’s important to try and give a slap of black all over the black parts of the model as it makes the coverage a bit thicker and gives a bit more depth. Remember to do the straps; use a small brush, ‘0’ size should be fine. 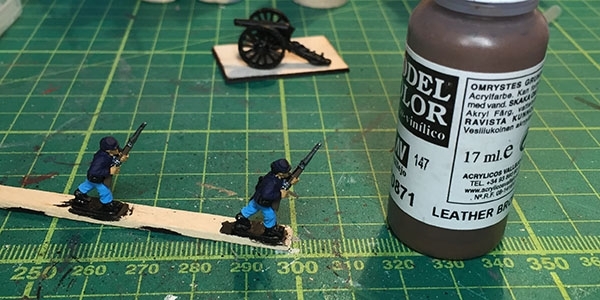 Next we paint the water bottle with the same blue paint as the trousers, Vallejo Andrea Blue 065, but this time no wash, so it’s going to look a bit brighter than the pants. In practice these bottles were a variety of colours with manufactures covering them with whatever material was to hand; however, blue seems popular. After that I paint the water bottle strap a Vallejo Off White 004. This requires a steady hand and it’s one of the details that makes the model look better painted than it actually is. 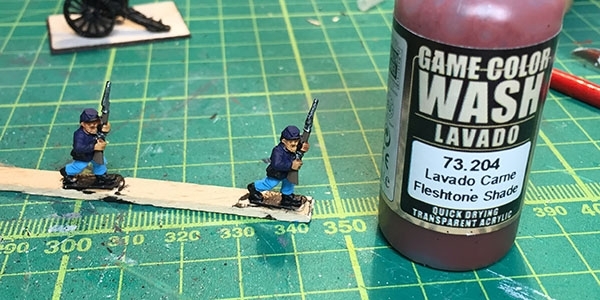 Next it’s Vallejo Gold 172 for the plate on the cartridge pouch, the end of the bayonet scabbard and, if you can, the belt buckle and front cross strap buckle/plate. Then finish off with the hair. I just stuck to 3 colours, black, brown and a light brown (for blond hair). This just leaves the varnishing and basing which I configures as a weekend job and not part of the 4 day routine. This entry was posted in Wargaming. Bookmark the permalink. 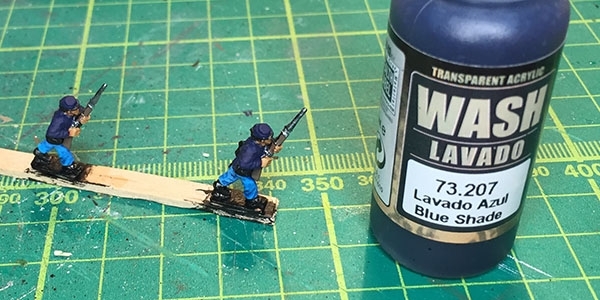 Love the ACW tutorial, but the real reason I was looking at it was to see how you did your basing. I am using the exact same basing material you are (.8 mm litko w magnet). How detailed did you go on your bases? Good question … actually I decided to be different with my bases this time. Normally I cover the base with PVA glue and add sand (actually I use that Games Workshop basing material). This time I have used polyfiller but I have been experimenting with colours and not found something I like yet. The idea is to get a light earth effect and then partly cover with glue and flock … maybe add the odd bush. Sorry I’ve nothing to show yet. Thanks! I’ve been using wood putty, add sand for texture. 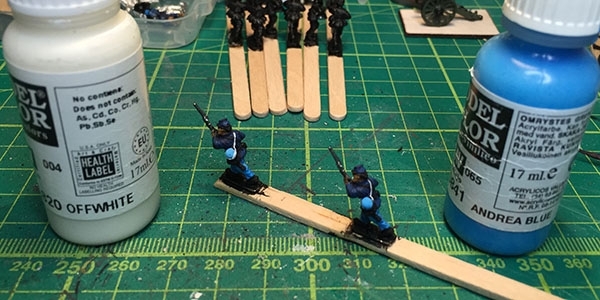 However, if I di that I assemble the stands before painting which tends to complicate painting as I have to reach around the other models on the base. 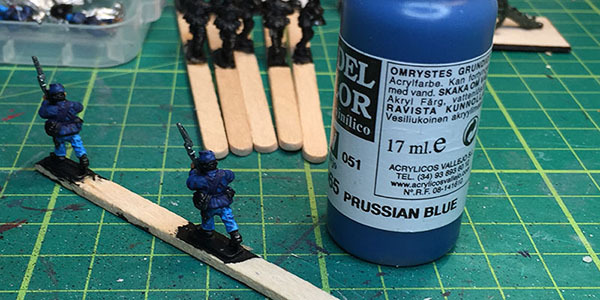 While on the topic of RF&F, do you find yourself planning to paint 10 stand regiments or are you going larger? I think judging by the ‘intro’ scenario in the book 10 is an average so you’ll need more in some cases. I’m not sure it matters that much for standard troops as you can interchange stands. You need some flexibility. Only a guess though, I’ve not played a proper game yet!